The National Spatial Strategy proposed a network of settlements under the 2017-2025 Philippine Development Plan envisions metro Cagayan de Oro as the Philippines’ 4th Metropolitan Center after Manila, Cebu, and Davao by 2025. However, if things go according to plan, Cagayan de Oro will have one big fat advantage over its three predecessors: a sustainable supply of potable water that can keep pace with its growing population. The first step towards the realization of this vision was taken Tuesday, August 15 when MetroPac Water Investments Corporation (MPW), a wholly-owned subsidiary of Metro Pacific Investments Corporation (MPIC) signed a joint venture agreement with the Cagayan de Oro City Water District (COWD) to organize a joint venture company which would undertake the supply of bulk treated water to address the increasing demand of Cagayan de Oro City. Metro Pacific Chair Manuel V. Pangilinan and Cagayan de Oro City Mayor Oscar S. Moreno led the ceremonial signing and project launch at a hotel in Makati. The joint venture agreement was officially signed a day earlier at the Local Water Utilities Administration office in Quezon City by MPW President Laurence R. Rogero and COWD General Manager Rachel M. Beja. The JV Corporation shall mainly engage in the treatment of raw bulk water (or purchasing treated bulk water) and supplying treated bulk water to COWD; and to undertake the construction, rehabilitation, operation and maintenance of various water production, treatment and transmission facilities and related infrastructure (including but not limited to reservoirs). 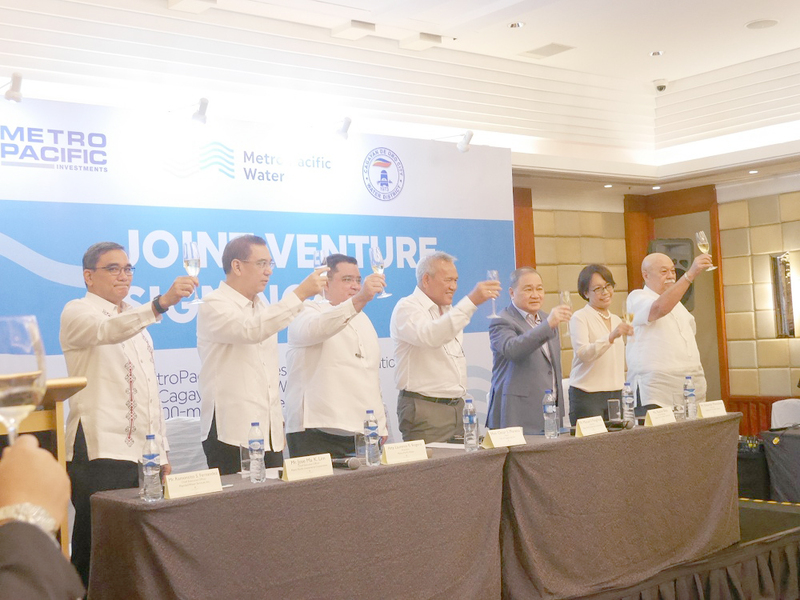 Paid-in capital for the Cagayan de Oro Bulk Water Corporation has been set at P140-million (M) with Metropac Water Investments Corporation putting up P133-M for 95% equity and COWD P7M at 5%. 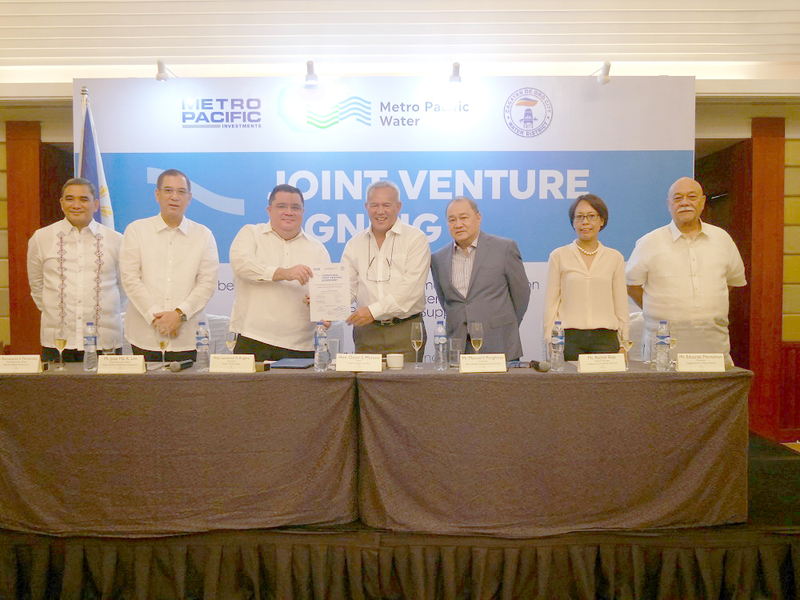 In a disclosure filed with the Securities and Exchange Commission, Metro Pacific Investments Corporation revealed that MPW was awarded the 100-MLD Bulk Water Project last March 21, 2017 after undergoing a comparative (Swiss) challenge as mandated by the 2013 Revised Joint Venture Guidelines of the National Economic and Development Authority. The project has a term of 30 years (renewable for another 20 years), and involves the supply of up to 100 MLD of treated bulk water to COWD, the disclosure stated. The P2.8-Billion project involves the construction of new water transmission lines and rehabilitation of the Camaman-an Reservoir, and will also eventually involve the delivery of bulk treated water to service the requirements of Cagayan de Oro’s western sector, which currently relies on deep wells for its water supply. To implement the project, the JV firm has the option of sourcing its treated bulk water either through the purchase of an existing facility, building a new one or buying its supply from an existing facility, he added. COWD currently serves a population of more than 700,000 residents and has approximately 85,000 service connections. Both partners recognize the importance of constructing and maintaining a sustainable water supply and have drawn a 3-stage road map to ensure this, said Joselito D. Velasco, senior manager, MPW Public-Private Partnerships. For Stage 1 covering the delivery of 60MLD to the Western Sector, the road map foresees putting COWD’s Cala-anan production deep wells on standby and its Balulang wells and booster pumping station to be operated intermittently. For Stage 2, 60MLD will be delivered to the Western Sector and 20MLD to the East. This is foreseen to place some of COWD’s wells and booster pumps in Macasandig on an intermittent operation, while at the same time bring water to Upper Gusa and Upper Carmen, as well as elevated subdivisions like Alegria Hills by installing additional transmission lines and starting service to Indahag through a sub-system. By Stage 3, with 60MLD being delivered to the West and 40MLD to the east, ground water extraction is expected to be reduced further by placing COWD’s wells in Agusan and Tablon on standby and further reduction in the operations of the Macasandig wells and booster station. 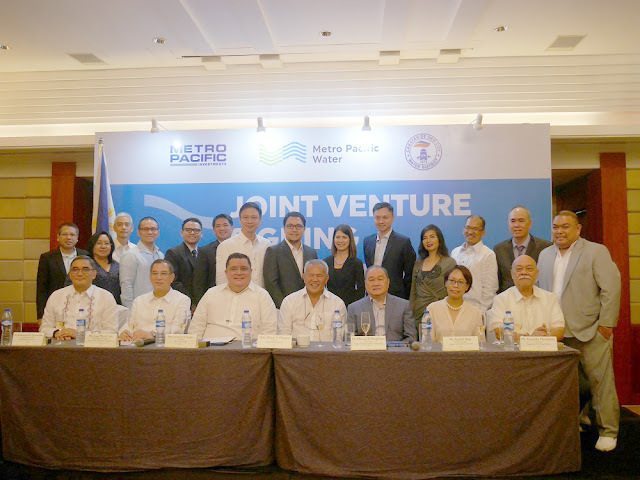 “We welcome Metro Pacific and its investment in water. Without that you cannot expect Cagayan de Oro to be livable, and competitive, and we need a lot of catching up to do,” said Mayor Moreno. “We welcome this joint venture to even grow further to respond to more challenging times ahead with the objective of making Cagayan de Oro the prime city down south. We have all the ingredients and this is one milestone in this episode of CDO that we are part of. Someday we will look back at this with pride and say we have been part of that history,” he added.